It’s one that few people join voluntarily, though there are exceptions (I’m talking to you, Lizzie Borden and Brian Blackwell). Among its current members are my children, their (step)siblings (who have joined twice – Ex married a widow) and, this year, some new members – my friend Andy and Ex’s sister, whose fathers died in the past year. When Dad was alive, Debby and I often bought him ties for Father’s Day. Not terribly original, but we were kids. And ties (clip-on only) were one of his wardrobe staples. For years after he died, Father’s Day was pretty much a non-event. 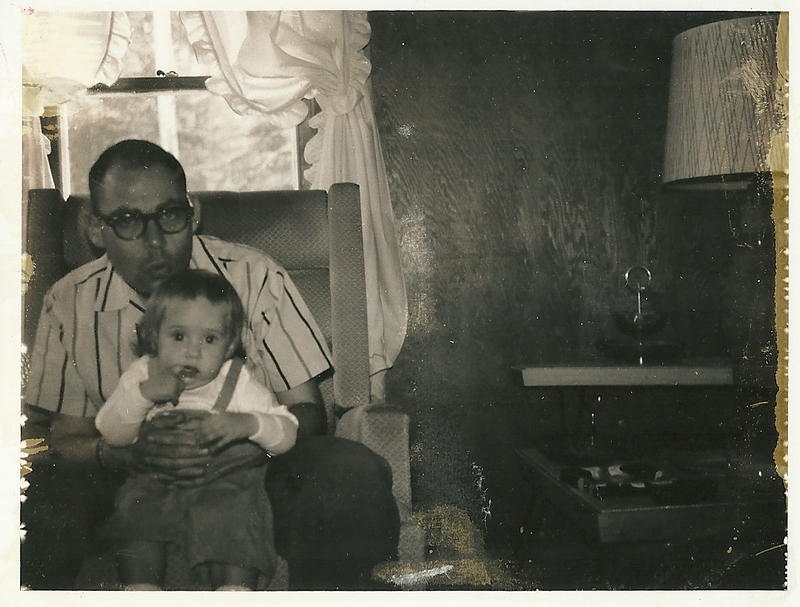 Me & Dad, before I was old enough to buy him Father’s Day ties by myself. In the ensuing years, our Father’s Day observances have been fluid. We have both had children and, in my case, multiple fathers-in-law. I was also lucky to acquire an older cousin who became the father of my adult life sometime after we met (in 1988) and before his death in 2005. My children’s father died in 2007 and his father – one of my two fathers-in-law – died in December (see “Death at Christmas”). Still, even when you don’t have a father, Father’s Day is a time when you might be reminded about what you’re missing. Two days ago, I got the following e-mail from my sister. She sent it to me and my middle daughter. Does your Father already have all of the ties that he could ever possibly need? Does he enjoy an exceptionally well prepared meal? Then why not treat him to an exclusive Father’s Day Brunch or Evening Buffetat the Faculty Club at the University of (City Above the 48th Parallel)? He will relish the wide selection of entrees masterfully prepared by our Executive Chef and deserts (sic) crafted by our Pastry Chef. Kids will love the chocolate fountain and those aged 10 and under dine free of charge. Make your reservation at 780-555-4231, but hurry as seating times are filling. I am writing to you to apologize for the recent email sent from the club soliciting our Father’s Day celebration. Although the email was meant to be on the light side, we realized that we unintentionally offended many of you by the way it was written. Please accept our apologies. Your continued support for the club is much appreciated. My gut reaction was a “same here,” referring to Alex’s comment about it being no different than a radio ad and seeming fine. But it did get me thinking about the line between advertising a service to people who might want it (in this case, the ability to tangibly acknowledge an important relationship) and possibly offending people who have no need for that service. Did it matter if people could feel left out and, consequently, offended? And if the answer was yes, might there have been a way for the Faculty Club to balance that somehow? In my response to Debby & Alex, I took a stab at addressing those questions. “Same here. I mean, I don’t think it would have worked if they’d put (unless he’s dead in which case we’re terribly sorry for your loss)….wait. Let’s try it! Then (assuming he’s not dead and you are not estranged – and again, we are very sorry if that is so) why not treat him to an exclusive Father’s Day Brunch or Evening Buffet at the Faculty Club at the University of (City Above the 48th Parallel)? and those aged 10 and under dine free of charge (see previous parenthetical statement). In retrospect, I realize there are plenty of other scenarios in which there might be no reason for one to observe Father’s Day by taking Dad out for a shi-shi meal (you have two mothers, your father is in prison, your father is in a nursing home and/or otherwise non-functional), but I was in a hurry. So I only hit on a couple of the high notes. Feel free to weigh in with your ideas and/or opinions. Regardless of whether today is a non-event or you have some sort of father or father figure in your life, here’s hoping you enjoy it. Later today, Sweetheart and I are going to spend some time with Sweetheart Senior, one of the more remarkable fathers roaming the planet. And as to why this is my first post in a month, it’s been eventful around here. Oh, man, you are so right about the motherhood thing. You should write it! It would be spec-fecking-tacular!